(MADRID-AFP) - Facing a squished budget, the town hosting Spain's annual tomato-throwing festival, La Tomatina, on Wednesday is charging a fee for the first time. 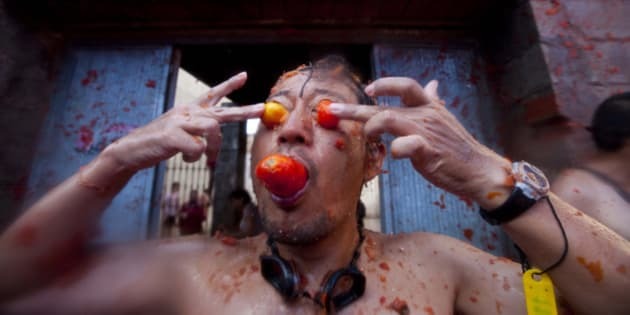 Some 20,000 people from across the world -- mostly Australians, Japanese and Britons -- will pack the eastern town of Bunol, many wearing goggles to protect their eyes from the stinging juice, before launching into a gigantic one-hour food fight. This year, for the first time, they are paying a minimum of 10 euros ($13) for the privilege of pelting each other with tomatoes in streets that end up flooded in red juice. The price rises to 750 euros if you want to get up on one of the six trucks that will bring in a record 130 tonnes of tomatoes. Some 5,000 free tickets have been set aside for Bunol residents. Organisers have cut the number of participants by half citing safety concerns over the size of crowds. This year, the festival will count on 180 safety officials, 50 private security as well as police and organizers. Emergency services will have nine ambulances, and several helicopters. "This is the first year we are charging for access to this popular festival due the need to limit the crowd for safety reasons," Bunol town hall said in a statement. "We have had a problem for the past eight or 10 years: the Tomatina is not controlled, we don't know how many people are going to come," Bunol Mayor Joaquin Masmano Palmer told Spanish media. But the town also says organising the food fight represents a "heavy cost" for public finances. For the first time, a private company, SpainTastic, has been charged with selling entry tickets to the Tomatina, sparking concern that recession-hit Spain's town festivals may be on the path to privatisation. Days before the festival, almost all tickets offered by SpainTastic were sold out. Among the top ticket buyers were Australians with 19.2 percent of the total, Japanese with 17.9 percent, Britons with 11.2 percent, Spaniards with 7.8 percent and Americans 7.5 percent. About 60 percent of the tickets went to people aged 18-35. The oldest was 82. Tourists also will be able to buy official Tomatina T-shirts, caps and coffee mugs. Spain's leading daily El Pais said Bunol town hall had a debt of 4.1 million euros and the tomato fight would cost 140,000 euros. The mayor has reportedly said the town hall hopes this year's food fight will bring in economic benefits exceeding last year's estimate of 300,000 euros because paying for entry "changes the level" of participant. Though the origins of the event are unclear, it is thought to have its roots in a food fight between children during a parade in the mid-1940s. It has grown in size as international press coverage has brought more and more people to the festival. After the fight, many of the revellers head to the local river to wash off the pulp.